Every year General Director Jan Mees and his team invite all its members for a VLIZ members’ day to thank the loyal members for their years of support and to get to know our newer members better. 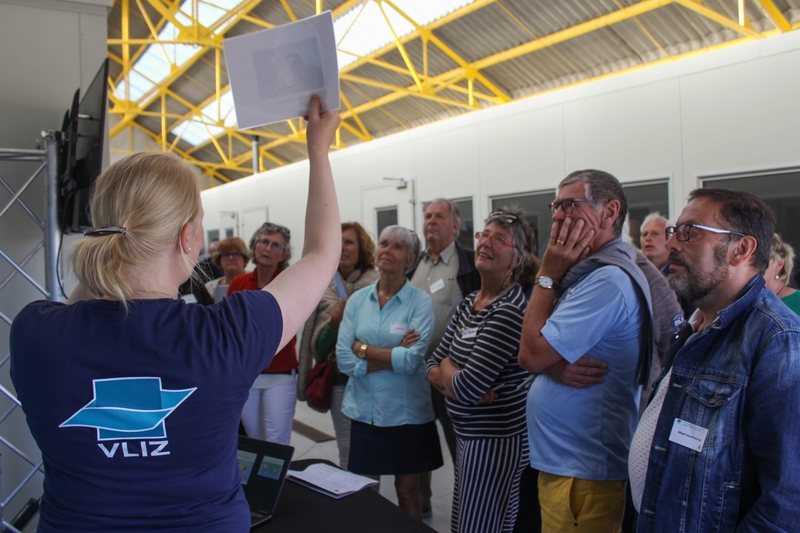 On Friday 22 June 2018, VLIZ organized a unique event for its members in the Marine Station Ostend. The theme of this edition was VLIZ philanthropy and the projects realized thanks to donations and membership fees. Marine scientists and VLIZ staff informed the visitors by means of info booths about these realisations. From cable bacteria up to killer whales, from antifouling paints over the healthy benefits of sea air, .... a wide range of interesting topics was covered. VLIZ offered a reception afterwards. The event was mainly in Dutch. Pictures of the event can be consulted online on the VLIZ website at the following link. What is the influence of sea water and sea air on our health? This evening was offered free of charge to all VLIZ members. Nonmembers were also welcome provided a fee of 10 euros. Alternatively, you could still become a member in the framework of this interesting event. Registration was necessary, no later than June 19, 2018. How sustainable is the consumption of shellfish? Pictures of the event can be found on the VLIZ-website under the following link. All members were welcomed at the renewed Marine Station Ostend (MSO) at the Slipwaykaai near the site Halve Maan for a cosy and informative midsummer activity. At 19:00 the guided tours started along the Eastern Bank, an area where nature, heritage, fisheries and other maritime activities, together with residential estate are looking for a common modus vivendi. The area also harbours an interesting history of Flanders’ marine science. Expert guides (Dutch speaking) shed more light on all these aspects, including the secrets of the military heritage (Fort Napoleon and bunkers of both World wars) present in the coastal dunes. Finally, a demo of the beach observation network 'SeaWatch-B' took place, one of the philanthropy projects set up by VLIZ through the financial support of members fees and donations. We closed off with a reception at the Marine Station Ostend. Pictures of the event can be consulted online on the VLIZ website at the following link.